We would like to welcome our new Speech Language Therapist (SLT) – Beth Laurenson – to the team at START. Voon Pang has taken on a new role at the University of Auckland this year, supervising Speech Language Therapy students, which means he has reduced one of his days at START. Janelle Irvine is busy in her role as Executive Director with the development of our organisation, and as a result we were in need of an additional Speech Language Therapist. We are excited about the growth of the START team. Having Beth join us ensures we can reach as many people who stutter as possible. Beth is a highly motivated Speech Language Therapist, experienced in working with children, teenagers and their whanau. Beth previously worked for a private practice, which provided a range of services to children and teenagers in Auckland. She has a keen interest in working with people of all ages who stutter. Beth is looking forward to specialising in the treatment of stuttering as she commences work two days a week at START. She loves what she does and is committed to providing the best possible service for people who stutter. Beth will be working alongside our SLT team of Anna Hearne, Voon and Janelle for the next few months as she develops her skills in working with people who stutter. 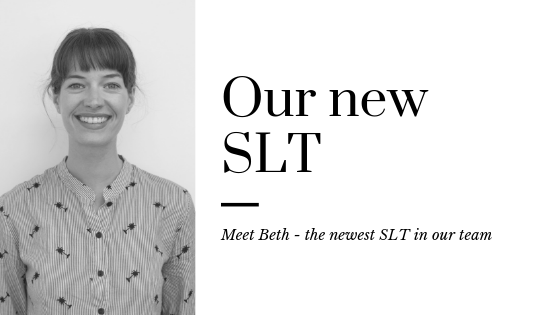 Our SLT team are looking forward to supporting Beth’s development as our newest stuttering specialist. So what motivated Beth to specialise in working with people who stutter? Welcome to the START team Beth! Previous Previous post: Why don’t I stutter when I speak with an accent?